MICHELE NORRIS, host: It's not every day a worldwide celebrity drops in for an unannounced visit. That's exactly what happened 81 years ago in a small desert town in Utah. The celebrity was Amelia Earhart. The aviator was hosted during her unexpected layover by the family of reporter Annie Feidt of the Alaska Public Radio network. ANNIE FEIDT: It's my favorite bit of family lore. As the story goes, Amelia Earhart crashed near Eureka, the mining town where my mom grew up and stayed in my great, great grandfather's house. As it turns out, the truth isn't so far off. But it was more of a force landing than a crash. She apparently ran into engine trouble over Utah and had to come down quickly in the Tintic Mining District. John Schmitt is a local history buff on the area. Mr. JOHN SCHMITT: I was doing the research in the 1980s, so the old timers were still alive at that time and one of them, Jim Maxwell(ph), told me that he was first on the scene. And she jumped out of the plane and said, where am I? Where am I? Because all she had was crude maps since she was following the railroad line from Las Vegas up to - to go to Tooele. FIEDT: It was September 30th, 1928. A few months earlier, Earhart had become the first woman to fly across the Atlantic as a passenger. Now she was flying her own plane, an Avro Avian folding wing biplane from California to the East Coast. As she touched down near Eureka, the plane nosed over, mangling her propeller and that's where my family comes in. My great, great grandfather owned the largest mine in the area and the only truck big enough to haul away Earhart's plane. 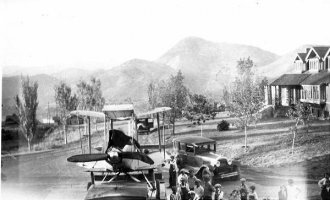 The plane went to Salt Lake City for repairs, but Earhart stayed in Eureka for a while. I called my mom's cousin Hal for that part of the story. HAL: And Amelia was invited to stay in my great grandfather's house. And she stayed three days and the family talk was that she was an incredibly interesting person and had a good time. FIEDT: The story is that Amelia Earhart especially hit it off with my great, great aunt, Mon Hillsdale(ph), who was a pioneer herself. Mon was unconventional for her day, willing to swim in public without her socks, drive her car along the rim of the Grand Canyon and shoot mountain lions. During World War I, she drove an ambulance for the French on the frontlines of the war and won a medal of honor for her work. My Aunt Banny(ph) imagines Amelia and Mon spending long evenings together drinking whiskey and sharing stories of their eccentric lives. BANNY: These were women that were way ahead of their time. I mean, they were adventurers and they, you know, they were just breaking out of the Victorian era. And they were wearing pants and doing all these things that men only did. And so, I think that they - I never read anything about it, but my feeling is they were kind of like soul mates. FIEDT: A letter Amelia sent to Mon backs that impression up. In a two-page note thanking Mon for her hospitality in Eureka, she writes: I shall always think myself fortunate in tumbling into Tintic, and you don't know how deep an impression was made. The feeling was certainly mutual and even several generations removed, that impact still lingers. I study the family pictures of Amelia and her wrecked plane and can't help but feel a small connection to the famous pilot. For NPR News, I'm Annie Fiedt.